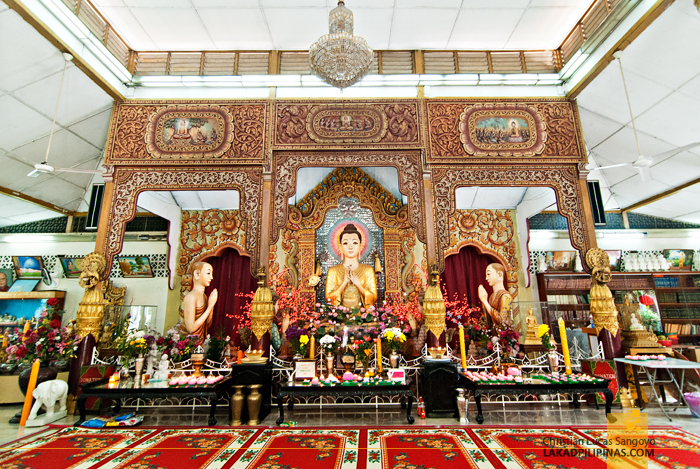 MALAYSIA | A Thai & Burmese Temple in Penang? 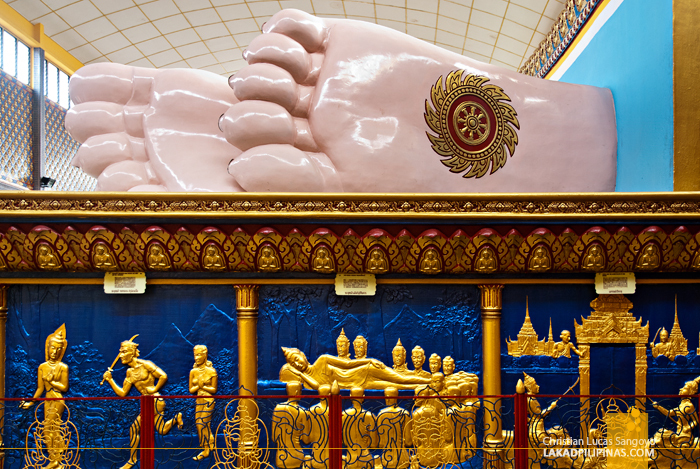 That’s one huge pair of feet, I told C as we went around the hundred and eight feet long reclining Buddha at Wat Chaiyamangalaram. And that’s also a mouthful of a name for a temple, I added. 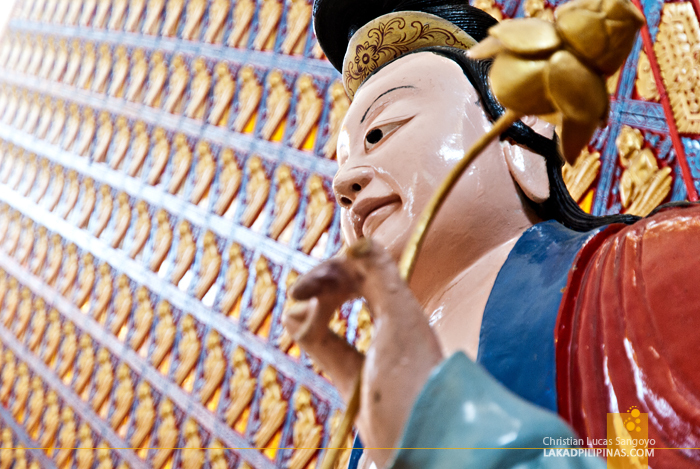 Wat Chaiya, it’s popular and shorter name, is one of the most famous Buddhist temples in Malaysia and it definitely wouldn’t be out of place if it were situated in Thailand. En route to the Straits Quay Marina, we passed by a group of kids with thanaka-painted faces, Myanmar’s distinct cosmetic paste made from grounded bark. It definitely made me wonder why there were a lot of Burmese people in the area; Penang being nowhere close to Myanmar’s border (it is relatively near Thailand’s though). 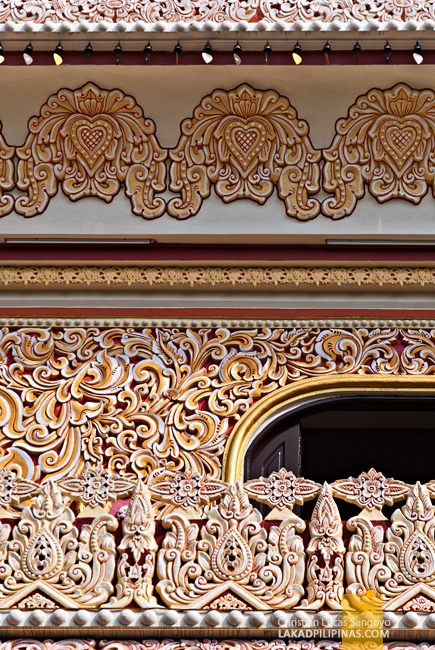 It turns out there’s a Burmese temple right in the place, along the aptly named Lorong Burma or Burma Street. 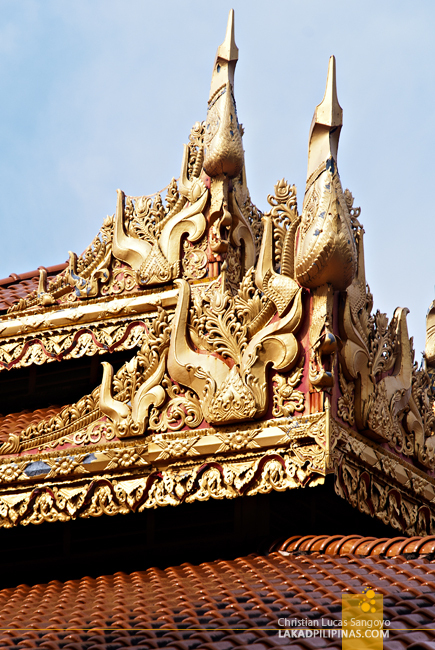 As we alighted from our bus, we immediately saw towering golden stupas, a distinct Myanmar temple feature, above Penang’s manicured treeline. The Dhammikarama Burmese temple, built in 1803, was interesting enough—I love how subdued their colors are compared to Thai temples, but the adjacent Buddhist temple also got our attention. 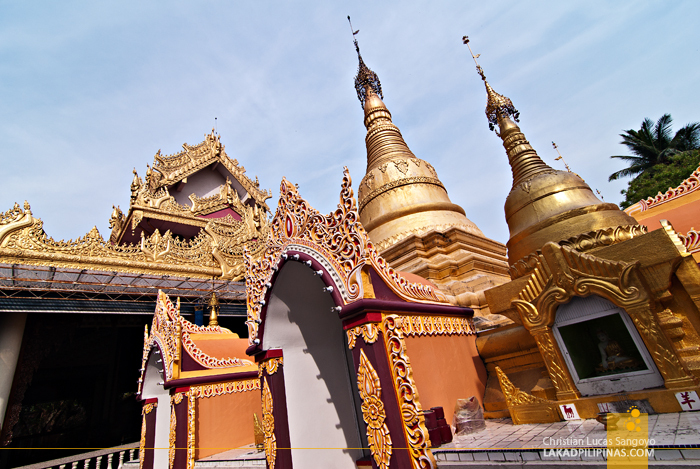 After a quick tour of the Burmese temple grounds, we transferred to the Thais. 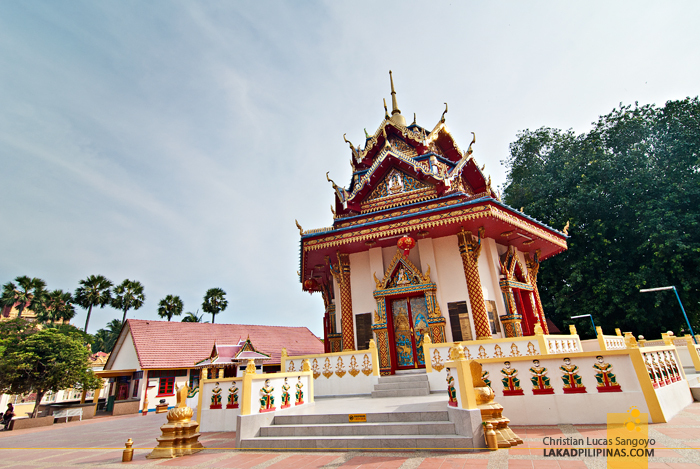 The Wat Chaiyamangalaram is set on a five-acre land donated by United Kingdom’s Queen Victoria to boost trade relations between the Thais in 1845. I’m not quite sure how, since the land is located in Penang. Might be there’s a sizable Thai populace in the area at the time. 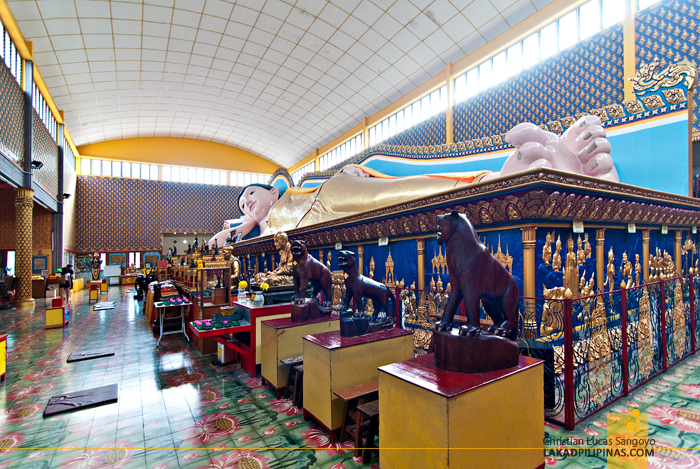 Anyhow, the temple is very Thai indeed; from its soaring roof, the intricate wall designs, nagga serpent guards and, of course, the multitudes of Buddha images inside the temple grounds; the most famous of which is the reclining Buddha at the main hall. It was said that the pose; lying on his right flank, head resting on a cushion with his right elbow as support, is of Gautama Buddha’s depiction on his deathbed during his last illness. 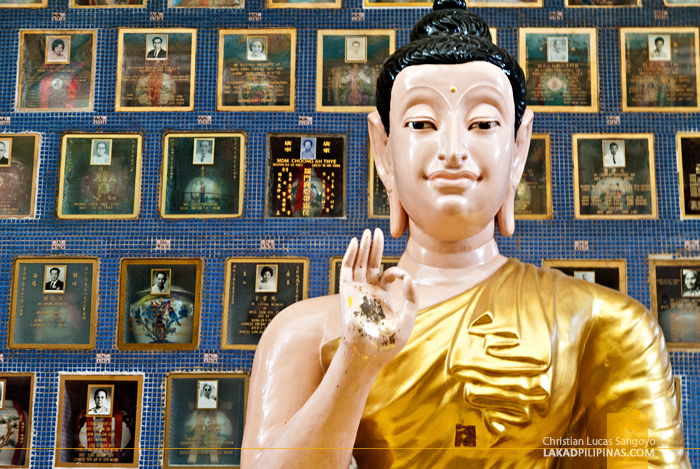 The serene facial expression denotes his preparation to enter paranirvana; the realm of the eternal true self of the Buddha. 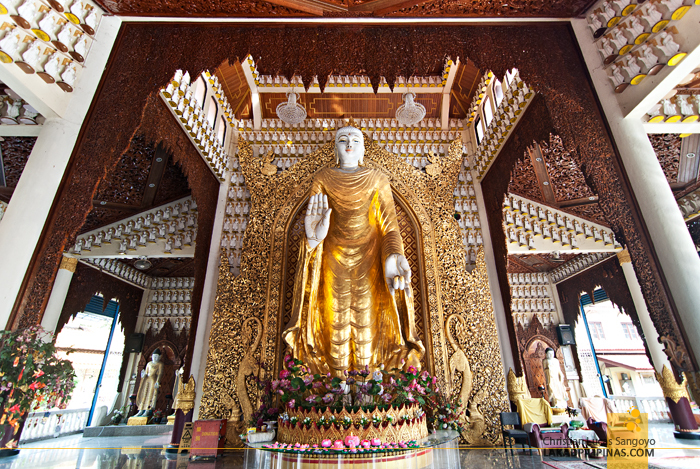 The image was the largest of its kind in Malaysia when it was built during the 1960’s but it has since been overtaken by the 131-foot Buddha image at Wat Photivihan, a temple near the Malaysia-Thailand border in the state of Kelantan. 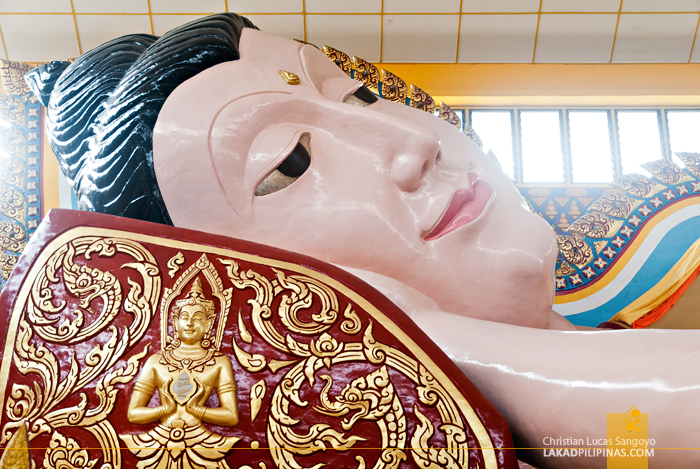 Still, the reclining Buddha at Wat Chaiya impressed me. 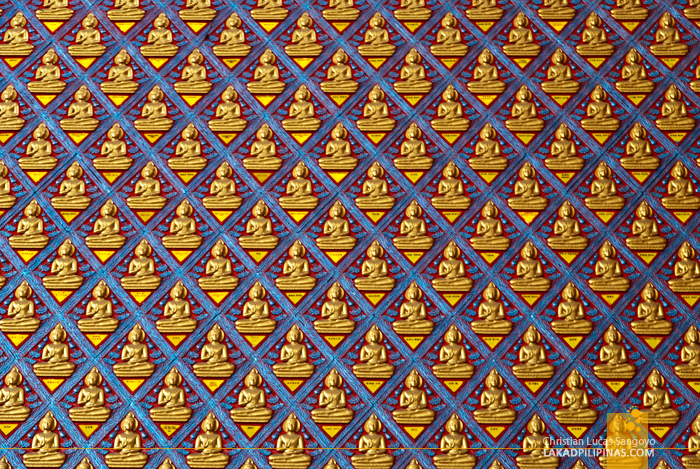 So did the walls surrounding it, which is beset by an unending gold Buddha imageries on an abhaya mudra pose—denoting protection, reassurance and blessing—on a striking blue diamond frame. The pattern it made was quite mesmerizing to the eyes. It was also interesting to note the series of glassed niches containing funerary urns at the back area of the reclining image, complete with fading portraits of the deceased. 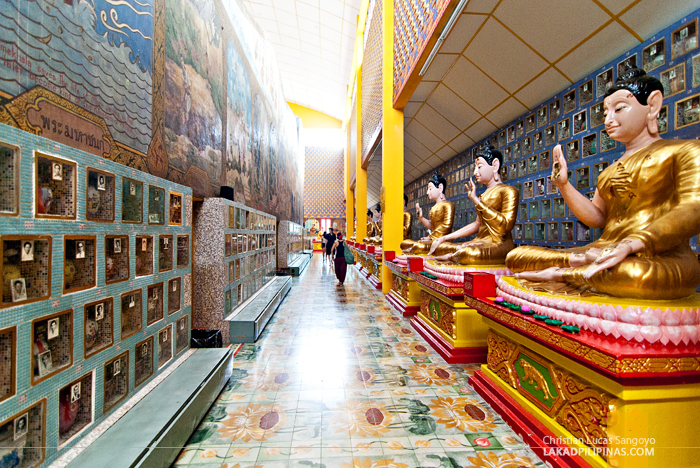 I guess this place also serves as a columbarium of sorts for Buddhist believers in Penang. That got me thinking, with the proliferation of Buddhists in the area, might this be the best place to experience the Water Festival in Malaysia? And indeed after Googling a bit, the famous Buddhist festival, Songkran for the Thais and Thingyan for the Burmeses, is well-celebrated during the middle of April right at this very place!